My earliest memories of Air Research are actually from dads important first business – Northbridge Drilling. A once mighty drilling contractor based in South Australia. In sourcing new technology Ken spent time in the USA – importing Schramm drilling rigs and parts for the business. It was from his trips to the US that he became interested in Air Compressors & Boosters. 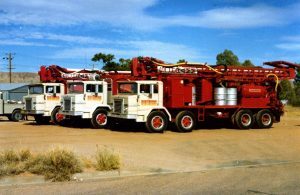 As agents, Northbridge Drilling introduced the Grimmer Schmidt booster to Australia. In the early 1970s Dad drilled all over Australia, with his young family in tow. Ardlethan NSW for tin. Cracow Qld for gold. Maldon Vic for gold. Georgetown Qld for uranium, and further north towards the gulf for uranium. Also out of Kalgoorlie WA for silver. Once Ken got a taste of life as a driller there was no stopping him, he reveled in the hard work and enjoyed the remote locations. He had a mechanical mind and went on to design a small drill rig which was used in the Coober Pedy opal fields. Being technically minded and driven to succeed in his own business, Ken decided he could make a better booster. 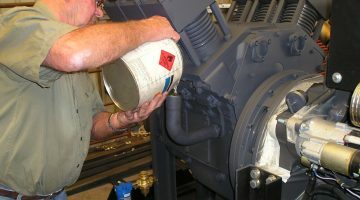 Using the knowledge he gained from his many trips to the US and the boosters he imported for his own drilling company – Ken embarked on making his own unique booster using the 2 stroke Detroit Diesel series 92 block. One bank of the V engine was to drive the other side of compressing pistons. 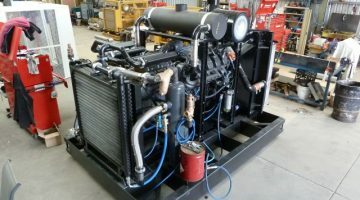 The legendary Air Research Compressor Booster was born! To this day it is the best single stage booster available. Over the years others have used the designs Ken trail blazed. Not phased, Ken happily offered his expertise and helped these companies produce a similar booster using his proprietary technology. Today Air Research stands out from others and has kept up the research & development of what essentially was born from a simple idea. Ken moved away from drilling to focus his efforts on Air Research in the early 90’s. As a young boy, I remember the many workshops/factories we had – Each one a bit bigger than the last. Ken had a way of surviving through the ebbs and flows – booms and busts of the drilling and mining cycles. This wasn’t something he wanted for me. He didn’t think anyone he loved should get into this business. He did his best by putting me through college in Adelaide but while he tried he couldn’t prevent his passion rubbing off on me. After year 12, I became an off-sider on some of his RC drilling projects when Northbridge was reformed. I did this for around 5 years and am passionate about the drilling industry and what my father developed. I took over the business when Ken Phillips, who had started the company some 25 years prior, lost his battle with cancer in Dec 2013. I saw no other option than to continue his legacy…. Ken was a very well respected man in the industry. He was in his early twenties when he bought a drilling rig and built that up to an impressive fleet of rigs and gear. But it was ARC which he turned his attention to, designing and manufacturing a better air compressor booster. There were some very good years pre GFC and continuing mining boom. To keep up with demand for volume and pressure – Ken expanded the product range to encompass not just the small compact integral engine boosters, but a new range of high volume coupled engine boosters. With drive engines from Caterpillar, Mercedes and Deutz he attached his already great Series 92 air end. The result was more air, more pressure and more versatility. He even managed to design a compact coupled version that it could still fit across the back of a truck. Today we have countless machines in operation in Australia and all over the world. Since Dads passing in 2013 the cyclical nature of drilling and mining has been apparent. We have managed to find alternative uses for our machines and new markets. The last few machines were delivered to Russia, being used in pressure testing for domestic gas pipelines. Being the proud Father to three sons, I am passionate about building on the solid foundations that my Dad left me. We are currently getting good interest from all over the globe; including USA, Africa, South America, Canada and Eastern Europe. Hopefully this is a good sign and local markets start to pick up. I know there are many contractors out there who are hoping the same. Traditionally our booster compressors are used by drillers to raise input air pressure, to increase drilling speed, greater depth and dryer samples. Our maximum advertised output air pressure and that of our competitors has always been 350psi input pressure boosted to 1000psi. With today’s new breed of after cooled, high pressure screw compressors and new developments in our own proprietary technology we are are able to increase pressure without increasing temperature to the components and importantly – air exit temperature. A win for drillers and WHS requirements. This has enabled us to meet certain needs for our new customers in Russia. Hence we have developed 2 new high pressure single stage boosters. New models named 1114 & 2214. These machines can safely achieve 1400psi output. In recent tests we were able to boost even further to 1500psi. We can now completely customise outputs for customers and specific jobs. All new machines have the ability to have parts retro-fitted to change specification. The new Air Research without Ken is running somewhat differently to the way he would have done it. Utilising the latest technology we have found ways to keep running costs down and stay competitive and innovative. We look forward to what the future holds and we are excited about the new partnerships and relationships we are making with like-minded companies.